The immediate purpose of this game is to provide evidence drawn from living experiences for the existence of a ‘surrealist poetic time.’ There is here a necessary prior consideration: to discover to what extent there is in each of us, and how intense the experience, an experience of time that overlaps with ‘forced time’ in all its possible manifestations. Testimony, modest but decisive, of an experience of ‘emancipated time.’ Naturally, what comes out of the answers will be a mystery that can transform the obviousness of the game into something new. Although this remains to be seen. 1) A clock face is found from which the hands are removed. 2) Each player designates a time associated with an event from his/her life that upholds the principle of the marvellous: revelation, passion, liberation, emancipation, encounter. 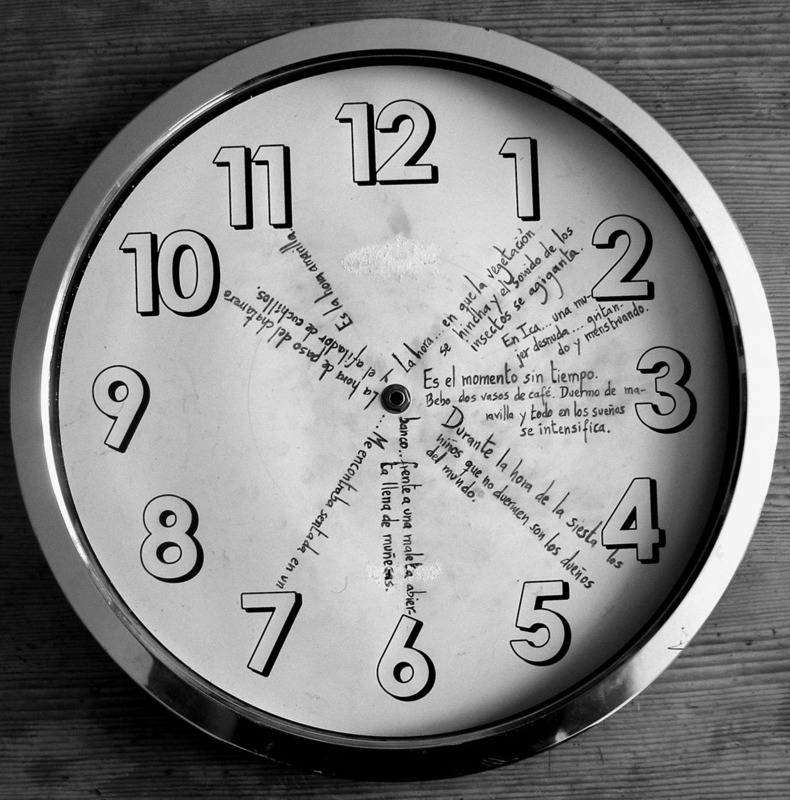 3) Each player selects a sentence that acts as an emblem of this lived experience and, upon the clock face chosen for the game, writes it against the corresponding time. Three o'clock in the afternoon, always and everywhere. It is the timeless moment, or perhaps better, when time is imperceptibly getting concentrated and becomes a little thicker, without any reason. Fortunately, it will never be possible to prove it. Eleven o'clock in the morning. It is the yellow hour. The moment when the sun reaches its maximum elevation, ie, at midday, between one and two o'clock depending on the location and the time of the year. It is the time of the excess of light, of extreme, hypnotic whiteness. The hour of hallucination, when vegetation swells and when the sound of insects is getting obsessively expanded.. A well of whiteness in which calcined snails accumulate; the feverish condensation of the open flowing in a spiral, sinking inward; essential geometry, charm. After lunch, I usually take a nap of half an hour, always at 3:30. I have been experimenting with caffeine intake and dreams for some time. Thus I discovered by chance that drinking two cups of coffee with milk before my nap not only allowed me to sleep but also granted my dreams such a plasticity and an authenticity that it allowed me to perceive colors, smells and even tastes. I could also access to intermediate states between waking and dreaming, reaching lucid dreams. It was surprising to me to see that this increase of ”exaggerated sensitivity” as well as a considerable increase of attention provided by caffeine, besides occurring in the waking state, also can also occur in dreams. Moreover I can add that I remember the dreams associated to the nap more easily in this way.